If you haven’t yet bought an air purifier for your home, it might be a good idea to consider getting one. Pollution and respiratory allergies are on the rise and if you have children or pets at home, an air purifier is a sound investment for the health of the family. An average person takes 1,200 breaths an hour, 28,800 breaths a day and 10,512,000 breaths a year. Bearing in mind that you would not even drink unfiltered and dirty water, why do you allow yourself and your loved ones to inhale stale and dirty air at home? Air purifiers clean the air by filtering and trapping dust, smoke, pet fur, mould, dust mites and germs from the air and producing clean and fresh air in the house or office. Here are some leading HEPA air purifiers to consider as a new addition to your home or office for better air quality and health. This air purifier from Deerma triples as an air humidifier as well as an aroma diffuser. It works to increase air moisture at your surroundings for more comfortable breathing while improving your dry skin as well. Besides, it can clear off odour, is radical-free and has zero radiation. There’s a slot made especially for the Silver Ion Water Purifier, and you can even control the level of misting the machine produces. Additionally, the air purifier will power off automatically in case there’s a water shortage. Our air is not recovering from pollutants anytime soon, and while that might affect our health, air purifiers will be our saviours. This one from Honeywell is designed with three stages of an advanced filtration system. It kills off about 99% of microscopic allergens and absorbs and decomposes room odour. Fret not, it will not eliminate moisture from the air; avoiding dryness that will produce secondary pollution. Children and people with allergies such as asthma are especially vulnerable to air pollutants. Philips has incorporated AeraSense to monitor air quality and react automatically to effectively remove ultrafine particles as small as 20 nanometres such as allergens, bacteria and dust particles for a room size of up to 95m2. There is also a sleep mode with adjustable lights while it silently functions emitting sounds of only 33 dB which is softer than a whisper, ensuring a better night sleep for you and your loved ones. Wake up feeling refreshed with fewer sniffles, coughing & itchy eyes. Owning pets doesn’t mean you have to live with their smells! Sharp air purifier combats pet odour and fur with its patented Plasmacluster technology. Plasmacluster disinfects the air by suppressing the effects of airborne viruses while breaking down and removing allergens such as dust mites and airborne mould. Additionally, its filtration system is effective enough to deodorize odours that linger on curtains, sofas and yes, even around your fur kids. The filters are reusable and have a lifespan of 10 years which is both environmentally friendly and value for your ringgit. This multifunctional air purifier has 5 sensors to detect dirt, odour, humidity, movement, and light to run automatically while cleaning the air using nanoe™ technology which can inhibit 99.9% of virus and bacteria. ECONAVI Technology minimizes energy consumption by adjusting automatically to operate only when needed preventing up to 60% of energy wastage. The unit also has a humidifier function to maintain skin moisture with a 3.5-litre capacity while the HEPA, Deodorizing, and Humidifying filters have a lifespan of 10 years. 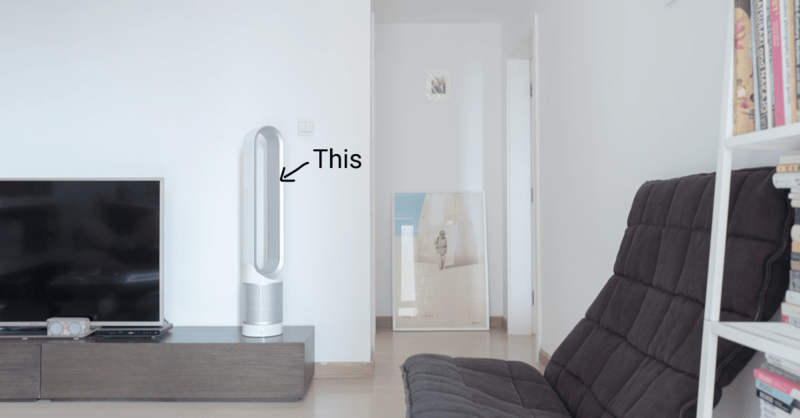 Dyson Pure Cool Link™ Tower Air Purifier is a hybrid device incorporating an air filter into its bladeless fan to cool you down on warm days. The sophisticated yet minimalist sleek design fits into the décor of both the home and office. It is also robust enough to be moved from room to room, effectively removing airborne dust for clean air in under 20 minutes. Maintenance is also a breeze with its disposable activated graphite HEPA filter which captures 99.95% of gases, allergens, and pollutants.